A number of loons continue to drop in to visit Mother and Father Loon. 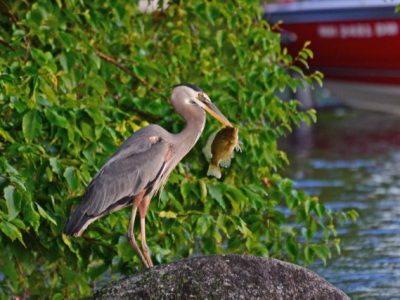 Some of them stay to fish for a few hours, but most of them leave the lake after socializing. The biggest threat this week has been visiting eagles. Two, sometimes three eagles have been spotted cruising overhead, as well as perched in trees along the shoreline. Loon Chicks Ping and Pong turned four weeks old on July 14th! They continue to grow and thrive under the loving care of Mother and Father Loon. 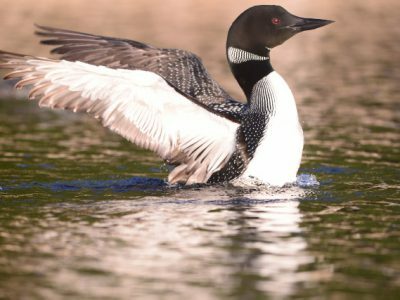 Occasionally they find themselves left alone, as another loon might be on the lake that needs a visit from Mother and Father. 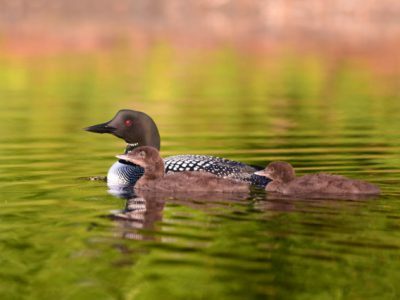 Most of the time the family is happily together...feeding, cruising, teaching and learning all the hundreds of loon lessons that little loons must learn! All about on the lake there are little ones, growing, growing so quickly. 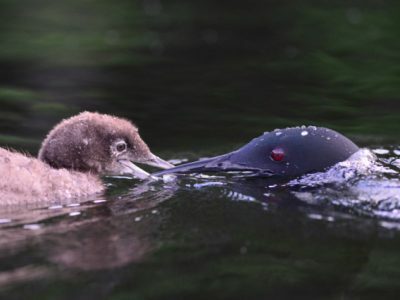 Mother Merganser has seven babies all full of energy as they zip along the shoreline. Mrs. Mallard and her three chicks look to be almost the same size. Mother Black Bear has scooped up fish for her two young cubs out on the raft. You might be so fortunate as to have a fairy whisper in your ear one morning, “The new day dawns! Come and see!”. So easy to brush her aside and go back to sleep. But if you rise...what enchantment awaits! Primrose lines the garden path, all aglow in the early light. And there is heron, with the first catch of the day.